Cutthroat Caverns: Teamwork + Betrayal = Fun! Overview: “Without teamwork … you’ll never survive. Without betrayal … you’ll never win.” That tagline pretty much sums up Cutthroat Caverns, a card-based RPG-style game from Smirk and Dagger. Although it’s been around since 2007, it’s new to me. You and your fellow players are fighting your way out of the caverns, each hoping to acquire the priceless artifact. Trouble is, you each want it for yourselves. If you don’t cooperate against the monsters, you’ll die in the caverns, but only the final blow to each monster scores the kill. Rating: Backstabbing is fun, but player elimination isn’t. Fun for the right crowd. Who Will Like It? Cutthroat Caverns is best for players who don’t take things personally — and don’t mind sitting by and watching if they get killed off by a fellow player. It has some of the feel of a classic dungeon crawl but it’s a pretty simplified RPG; as far as the mechanics go, the different characters are all the same. The characters and monsters of Cutthroat Caverns call to mind traditional RPGs (though that Egyptian-looking lady doesn’t quite seem to fit in), but without all that talking. Instead, you get right to the encounters — mostly monsters, though there are a couple rooms with various effects as well. Since the characters don’t actually have specific powers and abilities other than a select few cards, it can be a little more generic in the role-playing aspect. On the other hand, the game mechanics encourage a lot of table talk, bargaining, and bluffing, which is where a lot of the fun comes in. The game uses some of the terminology from RPGs but converts it into a diceless card game instead. Game components (click to enlarge). The cards are all pretty nice quality, and the character and monster cards (as seen above) are oversized, on sturdy cardstock. There’s one large cardboard Monster Life Tracker which also tracks the number of encounters, but oddly enough it’s just a little too long to actually fit inside the box bottom — it sort of sits on top of everything else, and fits inside the lid. The glass beads are used for tracking each player’s health, the current monster’s health, and the current encounter. However, we did find that it was very easy to bump a card (or the whole table) and the beads would slide around. I’m not sure what a better solution would be. Perhaps a cardboard token, though not as shiny, would be less prone to slippage. The artwork for the monster cards was done by a bunch of different artists, each with their own style. This means that the artwork isn’t consistent from card to card (some are considerably more cartoony than others), but it’s a cool idea to have a lot of different contributors. The goal of the game is to survive nine encounters with the most Prestige points by the end. The primary way to get points is by landing the killing blow on a monster, though there are a few other ways to earn points as well. And, of course, you can’t win if you die before the end. Each player starts with 100 health and seven cards. 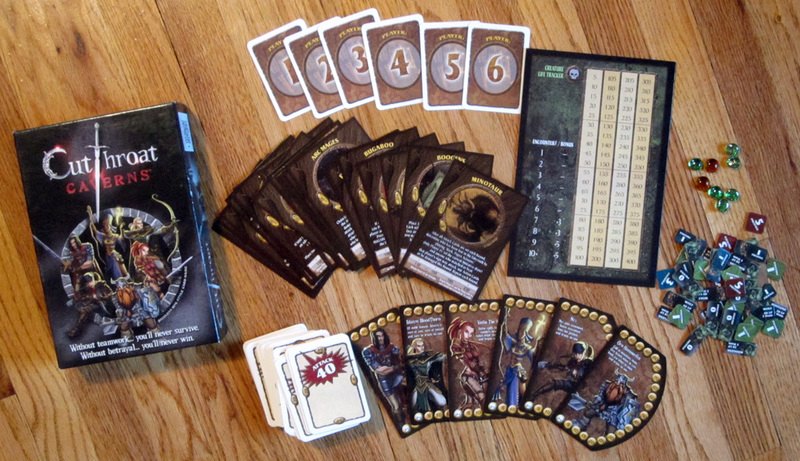 The encounters are shuffled and nine are dealt facedown to form the encounter deck. Then gameplay consists of rounds of combat until the encounter is resolved (or all players are dead), followed by some scorekeeping between encounters. The monsters starts with a number of hit points based on the number of players who started the game; even if some players have been killed off, you still use the original starting number as the basis. So if players get killed off early, the remaining players may have a harder time surviving later on. There are initiative cards that simply say “Player 1” through “Player 6.” At the beginning of each round of combat, these cards are mixed up and each player draws one, and this establishes the order in which cards will be played. 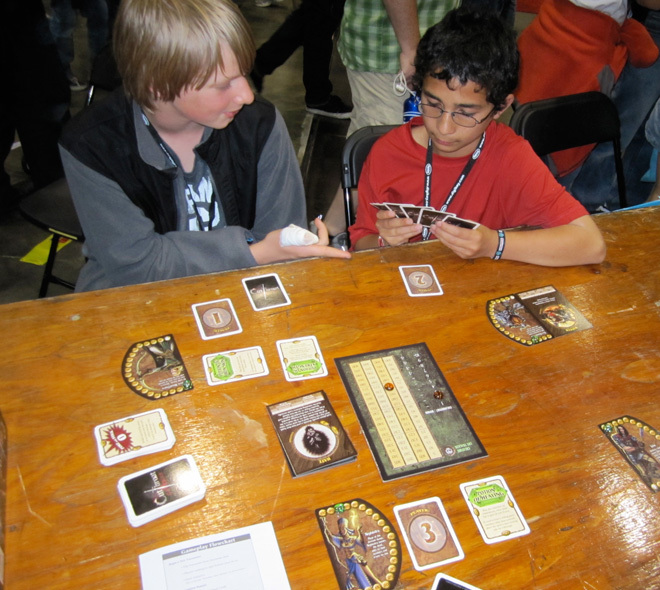 Then each player selects an Attack card from their hand and “sets” it by placing it face down in front of them. Players reveal their Attack cards in order of initiative, doing damage to the monster when applicable. Some Attack cards don’t do any damage right away, but are saved and will increase your next attack. There are also a few special attacks that depict one particular character. If you use the one with your character, the attack value is doubled, and the attack is protected — in other words, nobody can prevent that attack from hitting. Another feature of the Attack cards is that they have different values on each edge. Some cards allow you to double or halve an attack, and this is done by rotating the cards to the next higher (or lower) value. Once the players are done with their Attacks, the monster gets to attack, as shown on the monster card. Some attack based on who hit and did the most damage, or least damage, or who hit first or last. Some will attack based on the initiative cards, in which case you resolve the attack after drawing initiative for the next round. That way, you never know for sure during the combat round who the monster will attack later. Finally, once the monster’s attack is resolved, each player draws one card and combat continues. If a monster runs out of hit points at any time, the last player to land an attack gets the monster card to keep track of their Prestige points — though usually there are a lot of Action cards thrown about before that happens. When the encounter is resolved, players may then discard any number of cards from their hand, and then draw back up to their maximum hand (usually seven though this can be modified by other cards). There are a few item cards as well, potions which can protect you from damage, allow you to play two attack cards per round, and so on. Most of the potions must be “uncorked” before an encounter starts, though after the encounter card is revealed. You don’t have time during an encounter to drink a potion. Also, the potions are single-use items and don’t get shuffled back into the deck after they’ve been used. Cutthroat Caverns can be a lot of fun, but you definitely don’t want to play this one with people who take games personally. You need a group of gamers that doesn’t mind the direct, head-to-head competition. Because of the way the game works, though, you’ll need to get along with the other players at least to some extent: you need their help cutting the beasts down to size so you can finish them off. The Attack cards and Action cards are pretty funny, like the “Stab and Grab” which only does 5 damage to the monster but lets you steal a corked potion from another player, or the “I Think He Called You Ugly, Too!” which lets you designate the first player the monster will attack. The monster designs are really great, too, making for tough decisions about how to attack them. For instance, the Battle Troll does a good deal of damage the first two players to damage it each round — but if nobody damages it, it attacks everyone for a little less. If you’re the first player, do you stand by and let others attack it, avoiding damage for now but leaving the Troll alive? Or do you take one for the team, knowing that you probably won’t be the one to kill it off? The only thing I don’t really like about the game is player elimination, which can be tough in any situation. In one game, I got killed off during the second encounter, and had to sit and watch for seven more. Fortunately, I enjoyed watching the rest of the players interact with each other and the monsters, so I still had fun, but not everyone will have the same attitude. In another game I played, most of the players were too nice to each other and nobody died — in that case, I felt a little cheated, because I didn’t get the advertised backstabbing. 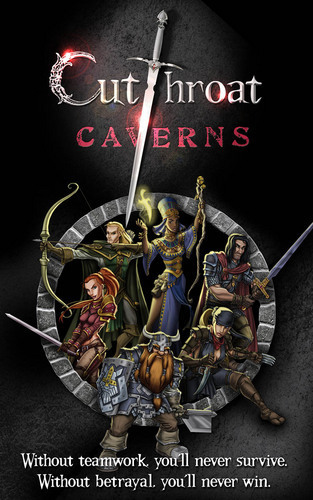 However, if you like RPGs and a bit of player conflict, Cutthroat Caverns is still worth checking out. You’ll have a lot of lively banter and quite a few groans of dismay. Wired: RPG-style game with a twist … of that knife in your back. Nicely designed monsters and funny cards. Tired: Player elimination isn’t so fun. Glass beads slide around easily. Disclosure: GeekDad received a review copy of this game.